Frame #1: The right arm enters straight and aligned with the side of the body. This is a position similar to that attained by Krisztina Egerszegi. The right hand has entered at about a 45 degrees angle. The left arm is very deep and beginning an inward sculling action. The head is back and down in the water. Frame #2: The right hand has rotated almost immediately upon entering the water and exerts pressure backward on the water by flexing at the wrist. The right leg bends at the knee in preparation to kick to assist the hips and shoulders to roll to the right. Pressure from the inward sculling left arm counter-balances most of the lateral force developed by the right arm. The head is raised slightly. Frame #3: The right arm bends at the elbow and some medial rotation of the upper arm places the hand and forearm in positions that will facilitate developing propulsive forces directly backward. The right leg kick nears completion as the hips and shoulders are rotated. Frame #4: The propelling surface of the combined hand and forearm is established. The right wrist has straightened. The upper arm is being adducted. The right leg kick is completed. The hips and shoulders are at their maximum angle of rotation and begin to roll in the other direction. The left leg begins to kick to counter-balance the vertical force component of the left arm which is being lifted well clear of the water. Frame #5: The lower right arm and hand are vertical and applying force directly backward. The propelling surface is at its furthest distance from the center-line of the body. The left leg is kicking and with the re-positioning will also counter-balance a lateral force component developed by the right arm. Frame #6: The propelling surface of the hand/forearm continues to move directly backward and remains wide of the body (instead of being pulled in toward the thigh). Adduction of the upper arm is nearing completion. The left leg kick is completed. The hand is being positioned to develop an inward sculling action and the head is being lowered. The right leg prepares to kick. Frame #7: The initial stage of the inward sculling action of the right arm is clearly visible. It starts well away from the body to establish room for it to sweep in and up. The right hand is not nearly as deep as the left hand depicted in frame #1. The head is back in the position exhibited in frame #1. The right leg kicks to counter-balance some lateral force component developed by the right hand as well as counter-balance the entering left arm. Frame #8: The right arm continues to accelerate inward and upward in its sculling movement. The left wrist flexes as the left arm develops propulsive forces. The right leg kick is completed, the head position is stable and low in the water, and the left leg prepares to kick. Frame #9: The left arm is well into its propulsive phase. The left leg has kicked and assisted the hips and shoulders to rotate to the left. The right arm inward scull is completed and the arm prepares to exit the water. 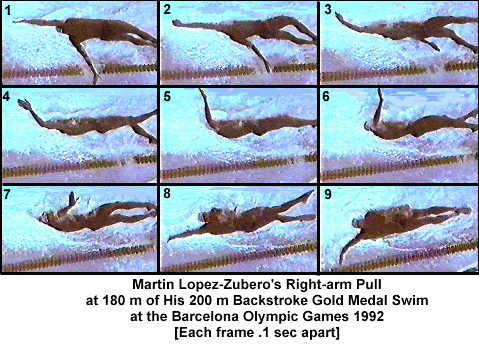 Martin Lopez-Zubero demonstrates a propulsive coordination between both arms which allows very little inertial lag between each pull. As the inward scull of the right arm is completed the left arm is already into propulsion (frame #9). This continual application of force is desirable and efficient. The directness of the swimmer's pull is notable. Instead of sweeping outward in the early stage and inward in the latter, the right arm bends early and considerably to generate propulsive forces backward. It remains wide as adduction of the upper arm is completed. This has to occur if an effective inward scull is to be produced.